Reaction was mixed as the administration offered to let states request federal exemptions from coverage. WASHINGTON — A White House offensive to resurrect the moribund House Republican health care bill got an uneven reception Tuesday from GOP moderates and conservatives, leaving prospects shaky for the party to salvage one of its leading priorities. Vice President Mike Pence and other top administration officials were offering to let states request federal exemptions from insurance coverage requirements imposed by President Barack Obama’s health care overhaul. Top House conservatives and moderates planned to meet with Pence and GOP leaders late Tuesday in hopes of finding common ground, but the odds for success seemed long. At the White House, Pence said he and President Trump “remain confident that working with the Congress we will repeal and replace Obamacare,” while White House spokesman Sean Spicer said Trump wanted an agreement, if possible. “I’m not going to raise expectations, but I think that there are more and more people coming to the table with more and more ideas about how to grow that vote,” Spicer said. But there was no evidence that the proposal won over any GOP opponents who’d forced Trump and party leaders to beat an unceremonious retreat on their bill on March 24, when they canceled a House vote that was doomed to failure. 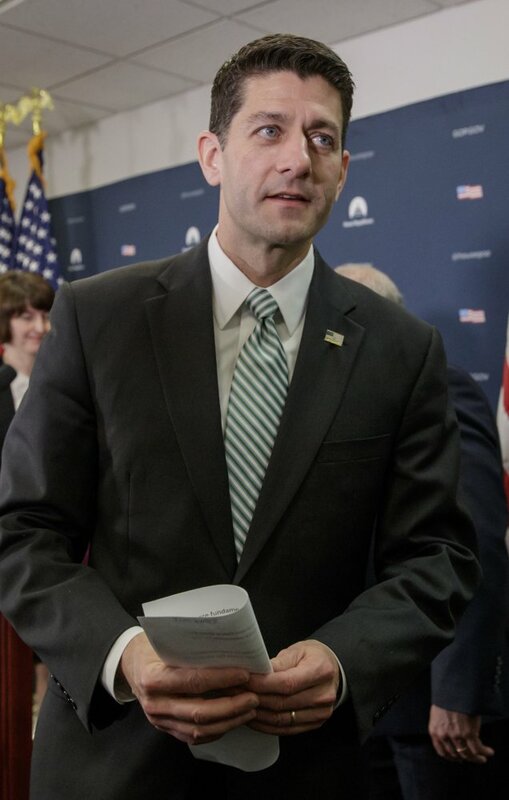 “We want to make sure that when we go, we have the votes to pass this bill,” House Speaker Paul Ryan, R-Wis., told reporters. He said talks were in “the conceptual stage” and declined to predict a vote before Congress leaves town shortly for a two-week recess – when lawmakers could face antagonistic grilling from voters at town hall meetings. Later in the day, Rep. Steve Scalise, R-La., his party’s chief vote counter, said talks were not at “a place where there is consensus” on health care and indicated a vote this week was unlikely. Under the White House proposal, states could apply for a federal waiver from a provision in Obama’s statute obliging insurers to cover “essential health benefits,” including mental health, maternity and substance abuse services. The current version of the GOP legislation would erase that coverage requirement but let states reimpose it themselves, language that is opposed by many moderates. In addition, the White House would let states seek an exemption to the law’s provision banning insurers from charging higher premiums for seriously ill people. Conservatives have argued that such restrictions inflate consumers’ costs. Reaction from rank-and-file GOP lawmakers was mixed. Moderate Rep. Frank LoBiondo, R-N.J., and conservative Rep. Mo Brooks, R-Ala., each said they remained “no” votes, with Brooks saying states should be allowed to opt out of Obama’s insurance requirements without seeking federal permission. “It is wrong to require the states to come to Washington, D.C., on bended knee,” Brooks said. “If leadership hasn’t learned the lessons of the failures of two weeks ago, then they’ll bring something forward where nobody knows about it and try and get it passed,” Renacci said. Even so, some members of the House Freedom Caucus, the hard-right group whose opposition helped sink the Republican bill last month, were showing signs of accepting less than many originally wanted. The group’s leader, Rep. Mark Meadows, R-N.C., said talks were boiling down to curbing several of Obama’s coverage requirements – a far cry from the full repeal of the statute that many initially preferred. Similarly, some moderates whose opposition was also instrumental in the legislation’s failure expressed cautious optimism that the White House offer would produce results. “We have to do things that will win people from both sides of the spectrum. Of course it’s hard,” said Rep. Tom MacArthur, R-N.J., a leader of the Tuesday Group of House GOP moderates.